Women’s Empowerment’s paid training program, The Get A Job Kit, celebrated its 100th graduate in July. The program also graduated its first two lead supervisors who will oversee production. 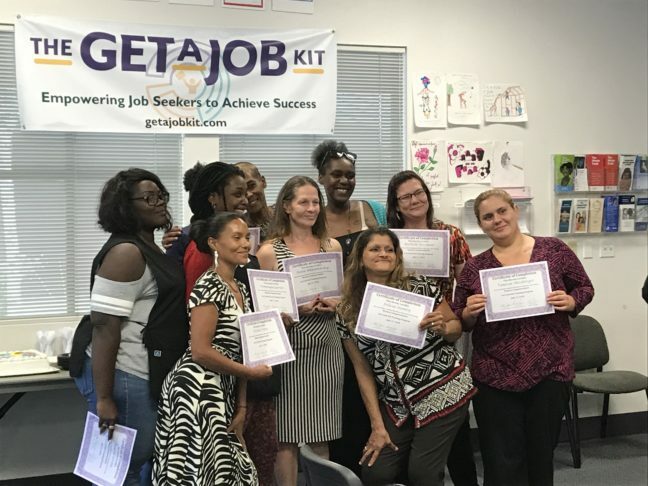 The Get A Job Kit provides formerly homeless women with 120 hours of training in production, customer service, quality assurance, forklift operation, shipping and receiving industries. Over four weeks, trainees are paid to assemble the Get A Job Kits to fill customer orders while receiving hands-on training, performance evaluations and relevant job experience. Women’s Empowerment is one of the only nonprofits in Sacramento providing paid job training to formerly homeless women, allowing women to gain financial stability while getting the work experience they need to succeed. More than 70 percent of The Get A Job Kit graduates have secured stable employment. The Get A Job Kit was launched under Women’s Empowerment’s name in 2014 after the business was donated by local entrepreneur Shirley Willey who created and ran the business for nearly 25 years. The Get A Job Kit has appeared on The Oprah Winfrey Show and CNBC, and in the Wall Street Journal, Washington Post and Los Angeles Times. The award-winning kit is an all-in-one career organizer designed to help organizations across the country empower job seekers of all ages and backgrounds. All profits from the sales of The Get A Job Kit are reinvested in the program, ensuring homeless women can continue accessing this vital paid training. Since launching the small business, Women’s Empowerment has sold more than 20,000 kits to Career Technical Education programs, high schools, veteran programs, nonprofits, vocational and technical colleges and anti-recidivism programs. For more information or to purchase The Get a Job Kit: www.getajobkit.com. Women’s Empowerment was featured on NBC’s The TODAY Show in 2015 for offering the most comprehensive job-readiness program in the Sacramento area designed specifically for women who are homeless and their children. The award-winning organization has graduated 1,527 homeless women and their 3,684 children. Last year, 92 percent of graduates found homes and 77 percent found jobs or enrolled in school or training. The program combines self-esteem courses, job training, health classes and support services to help homeless women across diverse ages, races and cultures. Women’s Empowerment is funded through private donations from the community and receives no government funding except for in-kind rent from the County of Sacramento. For more information: www.womens-empowerment.org.